However, since the election in Ecuador on 24 May 2017 of the criminal and cowardly president Lenín Moreno, Julian’s asylum has been under threat and the conditions of his stay in the Embassy have rapidly deteriorated. This is because Moreno has been anxious to divert public attention from the spotlight of corruption currently shining directly on him – see ‘Ecuador National Assembly to Start Corruption Probe of Moreno’ – and to secure the loans offered as bribes by US officials while capitulating to US government pressure to illegally terminate Julian’s political asylum. 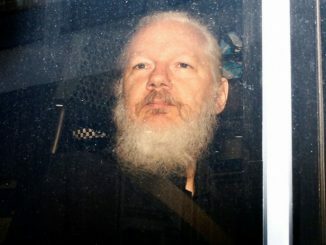 See ‘Ecuador Bowed to US Pressure, Violated Law – Assange’s Associate’ and ‘WikiLeaks Founder Julian Assange Arrested, Activists Rally to Stop US Extradition’. Find more from Robert J. Burrowes on InfoPages.